delighted to offer 2016/17 UK tour dates for Jazz Legend, Chris Barber. 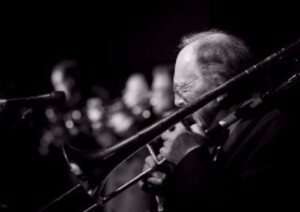 Chris Barber and his band perform to a sell-out audience at the prestigious Snape Maltings Concert Hall (capacity: 830) tomorrow night (5th Aug). Featuring his 10-piece band and playing music from across his 60+ year career, this concert forms part of his 2016 European concert tour. For further information on the concert click here. Please note: we have a certain amount of flexibility with regards dates outside the above period (dependent on travel/routing) - therefore please contact us should your preferred date fall outside the above UK tour periods. 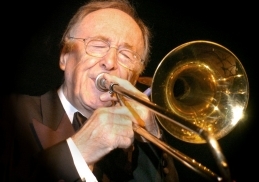 then you know you are held in high esteem in the music world"
One of the UK's most influential band-leaders and a bona fide Jazz Legend, Chris Barber celebrates his 67th Anniversary as band-leader with a Europe-wide concert tour, including a limited number of UK dates. Inspired by the 'King Oliver Creole Jazz Band', Chris formed his first Band in 1949 at the age of nineteen and has since gone on to become Europe's most successful jazz artists. His influence can also be seen across the music spectrum in bands and artistes such as The Beatles, Rolling Stones, Mark Knopfler, Eric Burdon, John Mayall, Eric Clapton, Van Morrison and countless other leading jazz and blues performers. Now with his 10-piece band, featuring a 7-strong front line, Chris plays a selection of his favourite music: from his roots in New Orleans style in ‘Bourbon Street Parade’ to the early music of Duke Ellington and Sidney Bechet ... before going back to ‘When the Saints’! The Big Chris Barber Band combine all these ingredients into an exciting, and often moving, evening of world-class jazz.